Billabong USA won three SIMA Image Awards at the 11th annual Surf Industry Manufacturers Conference in Cabo San Lucas this week, the most of any company in the competition. "Women’s Apparel Brand of the Year" the industry’s most prestigious title, was won by Billabong Girls. It was awarded for the women’s apparel brand that featured the most exciting designs, increased brand appeal, and business growth at retail in 2007. The “Environmental Product of the Year” was won by the Billabong Men’s division. 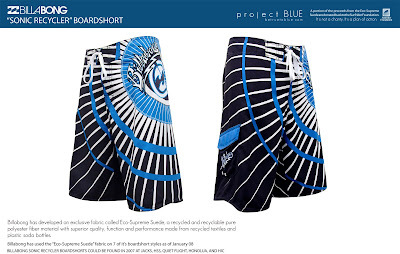 Awarded to a surf-related product created to lessen the impact on the environment, Billabong won that for the Sonic Recycler Series Boardshort, which recycles 10 plastic bottles per pair in its fabric. This joint initiative was done in conjunction with Surfrider Foundation’s Project Blue. The “Women’s Marketing Campaign of the Year” was awarded to the women’s brand that produced the most creative marketing campaign in 2007. Consideration went to women’s brands that displayed a creative, cohesive and consistent brand message in print, digital and point-of-purchase materials. Billabong Girls “Overload” campaign took top honors in that category as well.